We just call it logical. Provider Exchange Network –or PEN—is an electronic data exchange that streamlines the sales process by integrating the F&I Product Provider with the Dealers’ point-of-sale system. 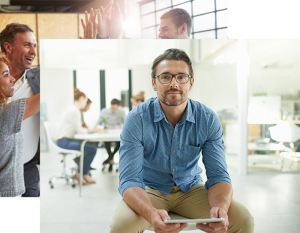 PEN connects the Provider to a network of Dealer Systems including DMS, Menu, and Specialty Applications. The Industry wants and needs eContracting and PEN enables Dealer adoption through unmatched, flexible integration. 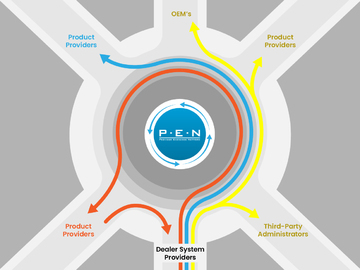 PEN connects many aftermarket Product Providers to many Dealer System Providers. We focus on the relationship between the Product Provider and the dealership’s preferred Dealer System Provider (DSP). DSP is a broad term for the software used by Dealers to promote the sale of aftermarket products. These systems include the DMS, Menu, and Specialty Applications. The PEN technology enables seamless aftermarket product eContracting through electronic ratings, forms and contract origination, streamlining the sales and administrative process. We help a Provider become more integrated into a Dealer’s workflow while PEN connected Dealer Systems enjoy the benefits of a more robust Dealer solution- without the heavy lifting. eRating enables Dealers to use their DMS, Menu or Specialty Application to receive accurate, real-time aftermarket product eligibility and pricing from the Provider directly into their current software. Aftermarket product eContracting complements the Provider’s System by eContracting in the Dealer’s System. The correct forms are sent by the Provider to the Dealer’s System and are automatically registered in the Provider’s Portal. We help Providers and Agents take full advantage of the PEN integration technology through eContracting educational and business support, and customized resources. PEN is dedicated to servicing 130+ Product Providers and Administrators, supporting aftermarket products such as VSC, GAP, and Tire & Wheel with integration to 30+ Dealer-based systems including the DMS, Menu, and Specialty Applications. Enjoy flexible integration with the systems Dealers already use to sell aftermarket products. Integrated eContracting is an extension of your existing eContracting functionality. DSP’s integrate to a standard API to access OEM & Product Providers. As a System Provider, you keep control of your user experience but do not need to maintain product rates and forms. PEN allows for easy Dealer adoption of eContracting and Dealers rely on their DSP for technical support, not you. eContracting also allows your Dealers to provide you with more timely reporting. 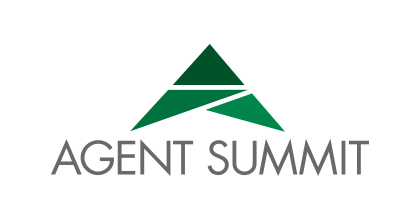 The Agent Summit is a great forum to gather all aspects of the industry. If you are a Provider, Agent or Dealer System Provider that wants to learn more about Integrated eContracting, look us up! Providers learn how PEN can connect your eContracting process to the leading dealership selling systems. Dealer Systems learn how your system can easily connect to a standard API to access PEN enabled Providers. Agencies learn how to connect all the dots to improve your dealer success. PEN is pleased to announce the promotion of Jon Brickman to Account Director. “Jon has lived our corporate values to help our customers get the most out of PEN,” said Ron Greer, VP Provider Services. Jon has been instrumental to the success of Integrated eContracting by helping clients improve internal processes, as well as educating their agents. “While our PEN technology works great to connect systems, Jon helps the people,” added Greer. Brickman will continue his work with Providers and Agents to increase Dealer utilization of Integrated eContracting. 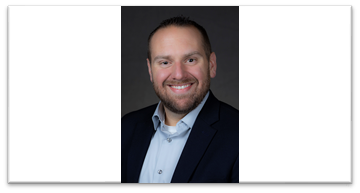 Jon’s focus will shift from customer service and support to a servant leadership approach, helping to create and manage programs designed to increase Provider benefits of Integrated eContracting. 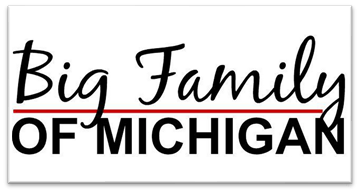 ODE employees got creative to raise money for Big Family of Michigan. ODE’s Annual Coat Drive, benefiting Big Family of Michigan, allowed us to donate a record 600+ winter coats this year. Baby to adult, this donation allowed for everyone on the Big Family’s list to receive a coat. From Euchre and Dodgeball Tournaments to a Virtual Garage Sale, everyone joined in and had fun for a good cause.